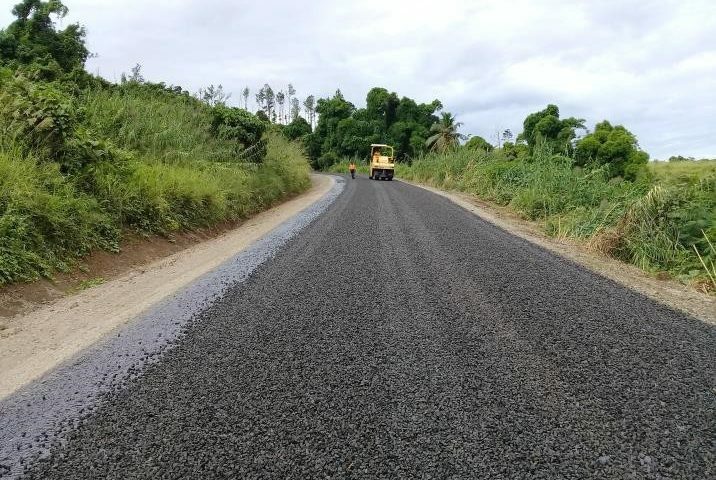 Fiji Roads Authority (FRA) has successfully completed sealing of 1.2km of road upgrade on the Nabouwalu Road to improve traction up the steel Solevu Hill. Solevu Hill is along Nabouwalu Road, which is 145.7km away from Labasa Town and close to Makolei Village and Immaculate Conception College in the Province of Bua. FRA General Manager Network Operations and Maintenance Aram Goes says these works are part of a major focus to improve the public bus service route along the lower south coast of Vanua Levu. “The route between Nabouwalu Jetty and Savusavu serves many populated communities with travel along the unsealed Nabouwalu, Kubalau and Wailevu West Coast Roads being the shortest distance from the Jetty to Savusavu, however many take the longer journey along the sealed upper Nabouwalu Road via Transinsular Road to Savusavu”. Due to difficult terrain and road conditions public bus services have been challenging with services provided from both the Nabouwalu and Savusavu ends, and no regular connection all the way through until the FRA commenced in 2013. Mr Goes said the FRA understands that the communities need reliable public transport and they are focused on major upgrades of the route between Nabouwalu to Savusavu along the southern edge of Vanua Levu. He said the sealing of this steep Solevu Hill incline is only the start of a major campaign to upgrade the access along this route and improve the quality of life for the numerous communities who live alongside it. On this route the other steep hill sections currently being sealed to improve traction for buses and private vehicles includes the Makolei Hill and Nadua Red Hill. Makolei, Nasawana and Navere along with sealing in front of Adi Eleni Primary School, Bulileka Santan Primary School, Immaculate Conception College, Ratu Luke Memorial College and Wainunu Health Centre”.